Power BI is well suited when we are connecting to other databases and sources. The visualizations are constantly improving. This helps it to be more effective in meetings and presentations. Some of the places where it is not very appropriate is that it is not available in the cloud. This makes it a little inconvenient. The deployment needs to be more flexible and there need to be video tutorials available so that it can be more user-friendly. Added mobile support will be a major plus. This is one area that has not been explored by other BI Tools. Allows assumptions to be created for fringes, taxes, capital etc. We are now able to push these type of expenses to individual departments as opposed to a single department. Gives us true costs for each department. The flexibility in revising and creating new sheets allows our organization to modify our budget/forecast approach without much downtime. Also, we can make these modifications internally . No need to hire consultants to complete these tasks. 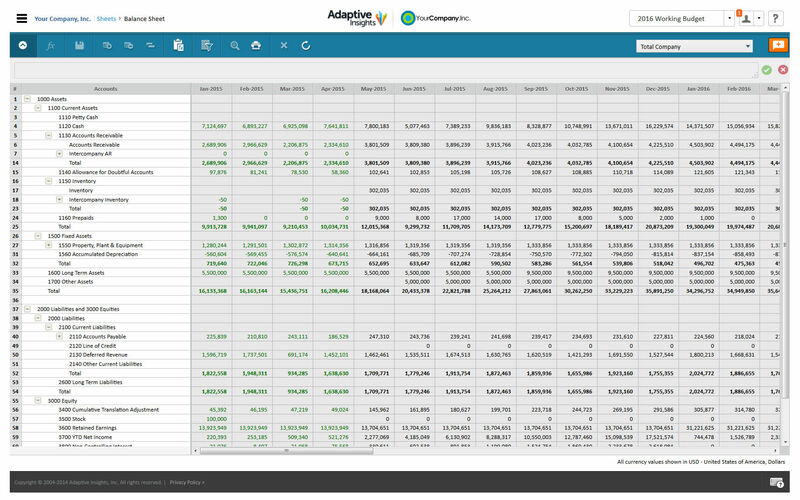 Adaptive Insights is an easy to use/understand tool for end-users. Our users typically struggle with new systems but the Adaptive roll-out was very smooth with very little end-user angst. Microsoft Power BI has excellent visualizations, patterns, spot charts. It has a great length of connectivity with databases and other software. This includes: MS Access, PL/SQL, JSON, SAP HANA, MySQL, etc. It's very cheap and helps focus on the right areas during presentations/meeting discussions. The format of reports when downloaded to Excel or PowerPoint could use improvement. Would be nice if you could inactivate GL accounts when they are no longer being used. Suppress rows functionality when set by the administrator to default to suppress if not data doesn't always seem to work. Connectivity with non-Microsoft tools: Power BI is great to integrate with other MS tools, but if you want to connect it with statistical or machine learning tools (R, Python, Mathlab, JMP, etc.) you might get in trouble. Tableau, for example, has an easy integration with R and Python. Not all features are available in the online version: If you want to use more advanced features, you will probably need to download the desktop version of Power BI. No desktop version for Mac: So, I use a Mac and I needed to use some extra features on Power BI. When I tried to download the more complete desktop version, I realized that there's no desktop version of Power BI for Mac! I had to borrow a PC from a colleague to run the analysis I wanted. Adaptive Insights is incredibly easy to use! OfficeConnect makes creating and updating financial reports a breeze! Power BI, Tableau, and QlikView are the market leaders when analyzed on Gartner`s magic quadrant for business intelligence tool. One of the critical drawbacks of all these visionary tools is the absence or expensive back end that are needed to support the infrastructure. Incremental data load is absent which is a critical requirement these days. PBI also lacks data level security and user group management compared to others. The learning curve in PBI is the least (because of excel and Powerpivot and exception of DAX) compared to other tools. PBI cannot be used for high data processing when compared to tools like Birst which has a robust backend to support the load. Month-end reporting: It's hard to say how much time Adaptive Insights has provided, but I can say we no longer have formula errors in Excel reports and refreshing financial statements every month only takes a couple of clicks. Budgeting/forecasting: We have saved a tremendous amount of time in our budgeting cycle. After importing a budget in Adaptive Insights and setting up the model with formulas, we are able to copy the most recent budget version into the next budget version and review. Being able to budget in Adaptive Insights also removes the possibility of formula and linking errors that come with Excel.